In the comic book world, Jack Kirby is a living legend. Co-creator of some of Marvel’s finest characters including Captain America, The Fantastic Four, Hulk, Iron Man, and Black Panther to name a few, Kirby hasn’t received the classification that he deserves. With Kirby’s death on February 6, 1994, Stan Lee has taken on the sole identity of the majority of characters that he helped create. Fortunately at this years D23 Expo, Disney is poised to honor Jack Kirby’s legacy in a memorable way. Of what would be his upcoming 100th birthday, Kirby along with Lee will be given a rightful Disney award. Though far from being recognized as a Disney legend, it’s nice to know that a studio is honoring a man who put his heart and soul into his comic book creations. It’s safe to say that without his influence we would not have the Marvel Cinematic Universe we hold dearly today. This November’s Thor: Ragnarok is a prime example that holds much of the color inspiration from Jack Kirby’s original artwork; a Kirby explosion if you will. However if you think that Kirby’s work stopped at Marvel, you’d be very wrong. Kirby also had a partnership with DC back in the 1970s where he himself created what he called the New Gods in DC’s Fourth World Saga. Why do I bring this up? Well, because it’s very possible that a lot of George Lucas’s inspiration came from the man who created The New Gods storyline. Did George Lucas Draw Inspiration From Jack Kirby’s New Gods? Let me start by explaining what the New Gods actually are. The New Gods are a fictional race who are natives to the planets of New Genesis and Apokolips. New Genesis is a planet filled with beautiful forests, mountains, and rivers that is ruled by the Highfather. Apokolips on the other hand is a volcanic planet which appears to be a nightmarish dystopia ruled by the evil Darkseid. The comic series came to be known as “Kirby’s Fourth World” where the battle of good vs. evil became very prominent. Now you may be asking yourself, what does any of this have to do with Star Wars? Well, as we dive a little deeper into Kirby’s story, you will begin to see the parallels. Not only do these two beings want to rule the universe they live in, but nearly every aspect of their story are strikingly similar. One major way they are similar is that they rule their own so-called planet. Darkseid is the ruler of the planet Apokolips while Vader is of course one of the head rulers of the battle station we know as the Death Star. Not only this, but they both have types of soldiers that do their bidding. For Darkseid it’s the Parademons (who we will later see more of in this years Justice League movie) and for Darth Vader it’s the Stormtroopers. Both share the abundance of quantity over quality soldiers. If you think the comparison’s end there, you couldn’t be more wrong. By ‘elite forces,’ I mean trained beings who are used for specific missions. For Darkseids elite forces, these powerful warriors of his include Granny Goodness, Desaad (a sadistic torturer), Doctor Bedlam (a being made of pure energy), Glorious Godfrey (a master manipulator), Kanto (a master assassin), and Devilance the Pursuer (aka the god of the hunt). These elite forces were sent to destroy those who opposed Darkseids reign including the Forever People. Fans will be getting a taste of at least one of Darkseids most powerful generals when Steppenwolf comes knocking on Earth’s door in Justice League. In Star Wars terms, these elite forces may be classified as ‘bounty hunters.’ Vader used most of these bounty hunters to track down Han Solo and the Millennium Falcon in The Empire Strikes Back. These include IG-88, Bossk, Dengar, Zuckuss and 4-LOM, and of course the most popular of them all, Boba Fett. Project Cadmus was a cloning facility located right outside of Metropolis that was known for its achievements in genetic engineering. The facility was also recognized for its use on human cloning and was very successful. 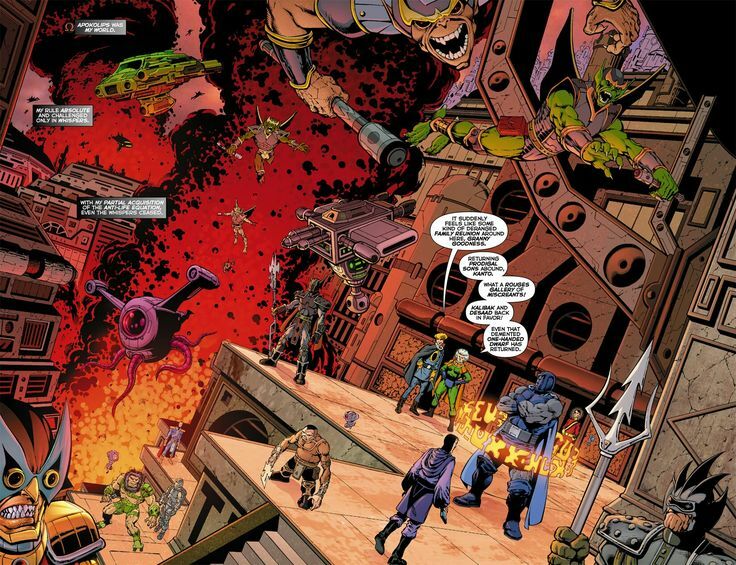 However once Darkseid got a hold of the facility, he was able to use it to his benefit and utilized its experimentation to create an army of hideous genetic constructs. These monsters would serve Darkseid and would be used to terrorize earth and cause massive destruction on the entire planet. Whether you’re a prequel lover or not, all fans of Star Wars know that the original Clonetroopers were all derived from cloning facilities such as the one established on Kamino. Star Wars Episode II: Attack of the Clones goes into great detail of how clones are made and are educated. This is yet another comparison to something taken from a DC property. Yes you heard that right. As if more comparisons couldn’t be made, Lucas himself borrowed yet another idea straight from Kirby’s New Gods. Boom Tubes are a “slang expression for an extra dimensional point-to-point travel portal opened by a Mother Box used primarily by the New Gods of New Genesis and Apokolips.” Basically it’s a way of getting around faster from one location to another. 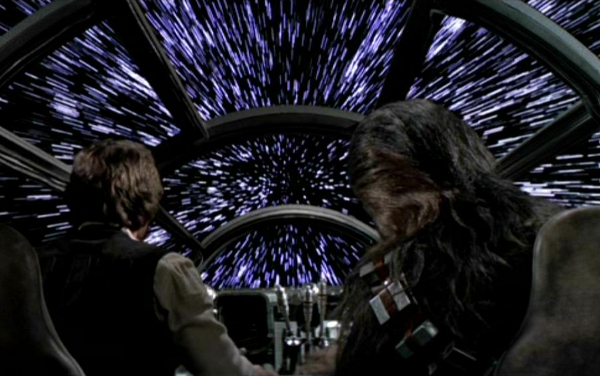 In Star Wars, Boom Tubes would of course be a reference to what we call hyperdrives. Hyperdrives (sometimes known as the warp drives) “was a vital starship engine system that allowed vessels to enter hyperspace to traverse the vast distances of space faster than lightspeed.” Like Boom Tubes, hyperdrives were specifically created to get starships from one side of the galaxy to another in just a matter of hours or even seconds. We all know what Lightsabers are in the Star Wars universe but could Lucas have gotten the idea of this type of blade from some of the New God characters? Perhaps. As pictured above, Bernadeth who is known as one of the Female Furies, wields what she calls a Fahren-Knife. This knife has the capability of burning a victim from the inside out quickly after getting stabbed. Bernadeth isn’t the only character who carries a weapon capable of doing the same thing. One of Darkseid’s leading military men Steppenwolf utilizes an Electro-Axe, his main weapon of choice. This axe is much larger than Bernadeth’s knife, but it can cut the same way while also burning the enemy from the inside out. Both of these items are ancient weapons, however they are given a futuristic upgrade to be used for combat situations. The similarities between these and lightsabers cannot be overstated. Orion is the second son to Darkseid with Kalibak being the other. At a very young age, Orion and Scott Free (who eventually became Mister Miracle) were child-swapped in an effort to bring peace between those living in New Genesis and Apokolips. This peace settlement didn’t go as planned but that didn’t stop Orion from becoming one with the Source. Orion was raised and trained at a young age by the Highfather of New Genesis (an Obi-Wan like figure if you will). The Highfather who’s real name is Izaya taught Orion to harness control over his own rage and anger. If not, the dark and violent nature of his own father (Darkseid) will eventually consume him. Orion eventually fights Darkseid and defeats him claiming victory over the planet Apokolips. He then goes to Earth in order to create an intergalactic peace settlement between the humans and the New Gods. Orion at one point even becomes a part of the Justice League. I don’t think I have to go into too much detail about how very similar this story-arc is with Luke Skywalker and the dark side, so I’ll keep this brief. Clearly Luke Skywalker and Orion share a nearly identical childhood. Both of their fathers were evil and were both taken away from their father at a very young age. Luke has to harness the power of the Force while Orion has to learn the ways of the Source. They also at some point combat against their own father and help establish a more peaceful galaxy. Now I’m not saying that what George Lucas may or may not have done was wrong, but what I am saying is that these comparisons should at least be noticed. As we all know, without the mind of George Lucas we would never have gotten the Star Wars universe we have today. Lucasfilm has done extraordinary things in filmmaking and has had a major impact on many filmmakers such as James Cameron, J.J. Abrams, Ridley Scott, and many others. But there’s no denying that Lucas didn’t at least take some if not most of his inspiration directly from Jack Kirby. The results are nearly analogous between Kirby’s New Gods and Lucas’s Star Wars. George Lucas took some of Kirby’s own creations and made it in his own unique way. It might be safe to say that without Kirby’s influence over Lucas, Star Wars may have turned out much differently. What do you think of the comparisons? Do you believe George Lucas drew heavy inspiration from Jack Kirby’s New Gods? Sound off in the comment section below!